Can’t decide which wallpaper to use as your desktop background? Me neither. 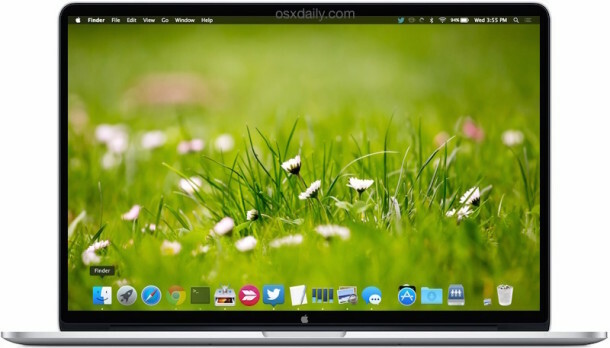 Fortunately there’s a setting in Mac OS X that causes the desktop picture to change itself automatically at a user selected time interval, ranging from every 5 seconds to once a day or upon system wake. Essentially this means your wallpaper will change itself on a set schedule, so you’ll never be stuck with the same image. You can use this to rotate through wallpaper pictures, or if you get creative, to make some pretty interesting desktop background effects, like changing colors, or going from a black and white picture to a colorized version, and so forth. Whatever your background picture was set to will be changed immediately, and then it will change again at the time interval you selected. If you need help finding some cool wallpapers, we’ve got plenty here. Changing every 5 seconds can be a bit neurotic, but if you have enough similarly themed wallpapers to go with, it can create a feeling similar to the living desktops of Android fame. This feature exists in nearly every version of OS X ever to exist, so it doesn’t matter what’s running on the Mac, it will be there for you to use if you want to have the active wallpapers like this. 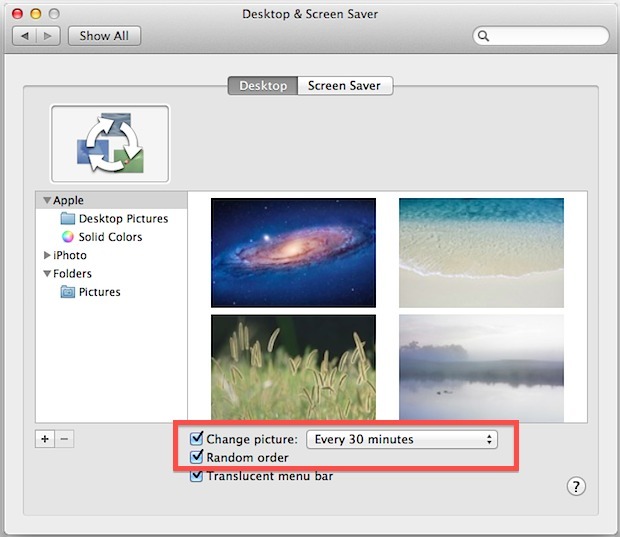 Another option is to use a free app like Wallpaper Wizard Lite, which will automatically download new desktop pictures in addition to changing them for you. I have my setup configured so that not only do I get new desktops every 15 minutes on each of the spaces on my laptop, but also on the large monitor I have connected to it. But, the biggest issue of all was figuring out how to get it to “see” my iphoto images so that I could use those instead of the Apple supplied choices. Didn’t I read in your blog how to do that? If so, you might want to connect folks to that post as a reminder. If not, that would be a good post to write for your faithful readers. I have my macbook set to rotate the image every 15 min, and I have it set to “fit to screen” so that the images don’t get distorted because I use a set of pictures that are all different shapes, sizes, and resolutions. I have the background set up to a shade of blue that is fairly neutral. My Question: Is there a way to make it so the background color, which shows on the side or bottom or top of my background picture, to change to best match the pictures that change? I have a feeling that the answer is no, but I figured I might as well ask. Thanks for your time. There was a great free windows program that coordinated the color behind each wallpaper pic, wallpaper changer.de by Frank Heinz (or something like that.) I’m searching for equivalent for OS X.
Mike: It won’t keep the changed desktop between boots, but if you don’t restart it will remain constant until midnight. I don’t know of another software or setting that would hold a persistent image between boots. I’ts sad that the Wallpaper Changer sees only the standard Fotos (or iPhoto) library. You cannot choose pictures out of another library. If You want to use Designer 2.0 to create a photo book You cannot see the Fotos library at all. With iPhoto it was no problem. Is there a way to do this from the command line (Yosemite or El Cap)? I was searching, and it looks like there used to be a prefs file one could toggle the XML in, but it no longer seems to exist. Want to know if their a way to changes pictures every 30 sec? Is it possible to select the auto random picture wallpaper setting from a specific folder only? Yes, add the folder to the left side menu of wallpaper options, and select that with the random wallpaper change. Does the changing pictures expend battery? I feel like a picture slide show going on in the background all the time will drain power, especially if it’s on the 5 second loop (which is the option I want to do).